This entry is a continuation of last week’s post on breweries in Brooklyn and we will pick up on the second Saturday. You can download my hand-drawn brewery map here and follow along. Inspired by a meeting of the New York Homebrewers Guild (every third Tuesday at Burp Castle, 41 E 7th St, New York, NY), this trip, an attempt to visit all the micro- and nanobreweries within New York City has stretched over the course of two weekends and counting. After departing Brooklyn Brewery and a walk along picturesque Manhattan Ave. in Greenpoint, we went up and over the Pulaski Bridge into Long Island City. For those of you unfamiliar with LIC, it’s an industrial area that contains much of the machinery that makes the densest areas of Manhattan habitable: taxi bases, recycling centers, distribution centers, repair and construction businesses, and light manufacturing. It is also undergoing an impressive highrise condo boom, with skyscrapers mixed in among low-slung brick buildings. A healthy lunch at Rockaway Brewing Co.
Transmitter Brewing (website, 195 Centre St, Brooklyn, NY) blends in with this mix of industrial uses. It’s a small building with a small tasting area not much bigger than a bedroom in the East Village. The beers here are poured from the bottles in which they have been bottle-fermented. They offer a small range of summery farmhouse and sour styles, which I wasn’t really feeling at the time, the weather being cold and rainy, however their innovative Community Supported Brewery program has me wanting to support to see what they brew next. Much like a CSA, members pay in advance for a selection of beers over six months. This is something I’ve never seen and hopefully allows them to capitalize their brewery and expand their offerings. A short ten-minute walk took us to our next stop, Rockaway Brewing Company (website, 46-01 5th St., Long Island City, Queens, NY). From reading older reviews on Yelp, it seems that they’ve been doing a lot of work to make the place inviting, and it shows: the space is big and spacious and feels like you’re either at the beach (based on the stuff lining the walls) or in a factory (polished concrete floors). Their beers tend towards the mild and drinkable, with a few nice malt-heavy options. Their stout was amazing, looking forward to when we can get it in bottles and not just in growlers from the bewery. Best of all, free Cape Cod potato chips! Can’t wait until they figure out how to add a patio or deck somewhere for the summer months. Another short ten-minute hop took us to Big Alice Brewing (website, 8-08 43rd Rd., Long Island City, Queens, NY). This place is small but looks shiny and brand-new. Wood bars and black chalkboards memorializing current and former beers line the walls. Overflow space is alongside the brewing equipment on the other side of the walls. Of all the breweries on our tour, Big Alice had the most innovative beers. Among the most memorable was the Salted Caramel beer, which was sweet and sour (in a beery way) and the Queens Honey Brown, made with real honey. We also had a smoked saison, aka “bacon beer” for its tasty smoked smell, and a White Coffee Stout, which I couldn’t really pinpoint as a coffee-flavored beer or a stout given its light color and smooth finish. Finback Brewery (website, 7801 77th Ave., Ridgewood, NY). I don’t know much about them other than people love them on BeerAdvocate and Yelp and I hear they have a huge space. 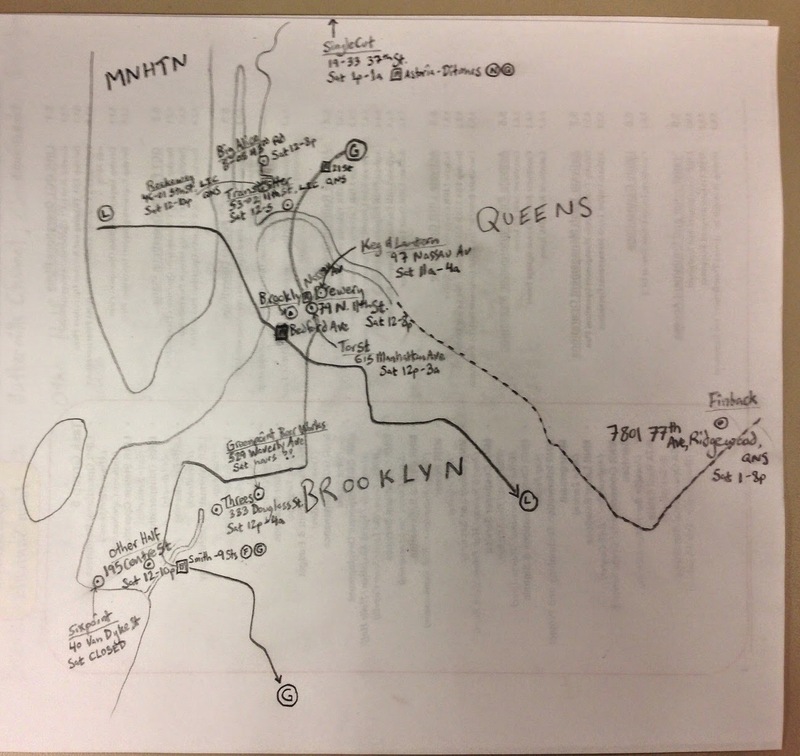 Coming soon, the remaining breweries in Manhattan, Queens, and the Bronx.